Changing font characteristics can make a pane's existing text unreadable; thus such modifications should be avoided while in QSO. When a receive channel is selected, the label to the left of its pane (on WinWarbler's main screen) is given a unique color; The Selected Channel setting specifies this color. Since each channel label appears over a panel whose color matches the font color of its associated receive pane, choose a color for the selected channel label that contrasts with all three receive pane font colors. 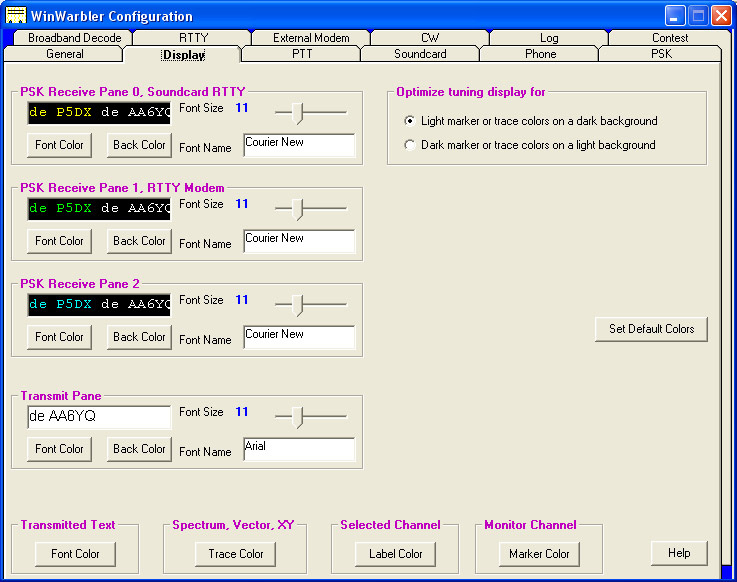 The Optimize tuning display for panel determines whether Monitor Channel markers will be shown against a white background and tuning display trace borders will be rendered in black, or Monitor Channel markers will be shown against a black background and tuning display trace borders will be rendered in white. If you you select light receive pane font colors and dark receive pane background colors, then you should chose Light marker or trace colors on a dark background and select a light Monitor Channel marker color (e.g. white) . If you you select dark receive pane font colors and light receive pane background colors, then you should chose Dark marker or trace colors on a light background and select a dark Monitor Channel marker color (e.g. black) . Changes made to the above settings are immediately applied, so you can assess your customization by direct observation. To reduce the need for flipping between windows on systems with smaller screen sizes, each panel contains a preview textbox illustrating the appearance of both received text (on the left) and transmitted text (on the right). Clicking this button sets all colors to reasonable default values. If incoming text is not visible because font colors and background colors lack sufficient contrast, this function will rectify the situation.